Here at Signature Smiles, we believe in giving the people of Woodinville the most advanced dental care possible. This means using state-of-the-art technology that improves the treatment experience and enhances overall dental wellness in the process. Laser dentistry is one of the many advanced treatment options we offer, and it's made a positive impact on the lives of many patients. Let's take a moment to consider how it can help treat gum disease and what you should know about its uses. Gum disease refers to the bacterial infection of the gum tissue. It is caused by the same oral bacteria that causes bad breath and tooth decay. When the gum tissue is infected, it can lead to bleeding gums, irritated gums, swollen gums, gum recession, tooth decay below the gumline, loose teeth, tooth loss, and the spread of the infection to other parts of the mouth. It's easiest and most ideal to treat gum disease at its earliest stages. The most common treatments for gum disease tend to involve the use of antiseptic rinses and medication to get the infection under control. Antibiotics can be used for more severe cases of gum disease. Dentists will also rebuild the gum tissue through gum grafting and perform root planing and scaling to help protect the teeth from serious wellness issues. Laser dentistry refers to the use of lasers to aid dentists. They can be used for diagnosis of dental problems as well as treatment of the teeth and the gums. 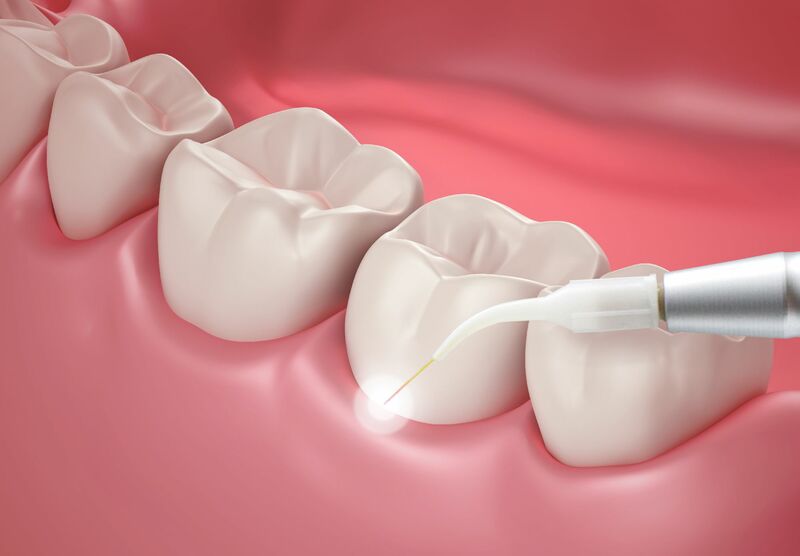 When treating gum disease, laser dentistry can be used as part of the root planing and scaling process. Also known as deep cleaning, root planing and scaling involves the removal of tartar and uneven tooth structure along the gumline, keeping the tooth surface smooth and less likely to develop tooth decay or contribute to gum disease. The laser used in deep cleaning treatments helps pull the gum tissue back away from the root of a tooth, allowing dentists to clean and adjust this portion of the tooth structure with ease. Laser dentistry can also aid in removing gum tissue that is too seriously affected by gum disease to remain in place. Less Bleeding During Treatment – Soft-tissue dental lasers cauterize as they cut, which means patients experience less bleeding during laser dentistry treatments. Reduced Risk of Infection – Since the laser cauterizes while cutting, there is a much lower risk of infection in patients. Faster Patient Healing Times – Patients who undergo laser dentistry treatment heal much faster than patients who undergo oral surgery with traditional surgical tools. Reduced Discomfort During Recovery – Since healing times are faster and the surgery is generally free from issues, patients often experience a much more comfortable post-treatment recovery. For more information about laser dental care and how it can help you experience improved dental health, be sure to contact an experienced cosmetic and restorative dentist today. The team at Signature Smiles looks forward to your visit and discussing these matters in much greater detail.